Founded in 1990 after the merger of Prodair and L’Oxygène liquide, Air Products is one of the major providers of industrial gas throughout the world. Air Products employs about 17,000 people in 50 countries and tries to be the world safest and most efficient industrial gas company. It offers sustainable solutions and excellent service to its customers. 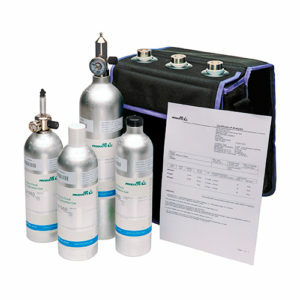 Calibration gas cylinders are designed to calibrate and periodically check gas detectors and other devices such as chromatographs, gas analyzers, alcohol breathalyzers & interlocks or modified atmosphere packaging analyzers. We provide a wide range of single use disposal calibration gas cylinders. Thanks to a large available stock we are working with many customers in many different applications. Our available range covers a large panel of applications, from simple LEL binary mixtures up to multiple and complex mixtures used in laboratories with very low concentrations (a few ppm). These calibration gases are gravimetrically mixed in compliance with the ISO6142 standard, which allows high accuracy of concentrations and an optimal shelf life. Thanks to its expertise, Air Products provides perfect solutions with a very large range of calibration gas mixtures and high purity gases. These mixtures are presented in non-rechargeable cylinders (capacity goes from 12 liters to 110 liters, the largest capacity in the market). 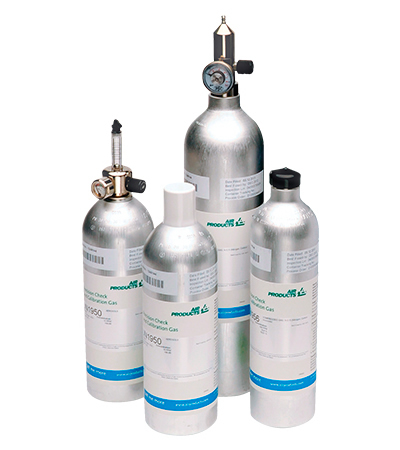 In addition to our large range or calibration gas cylinders, many accessories are also available such as manual or automatic flow regulators (for calibration stations) with standard or specific coating forcorrosive gases like chlorine or ammonia. In order to be compliant with current European legislations, recycling tools for disposable cylinders are also available for pressure vessels. Soft and rigid carrying cases are available as well to safely carry gas cylinders. In the European Union, single use pressure vessels can be recycled as non-hazardous products within the classic garbage recycling system. 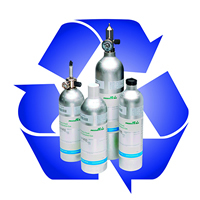 In addition to their large range of accessories for gas commissioning, Air Products also provides recycling tools for calibration gas cylinders disposal. 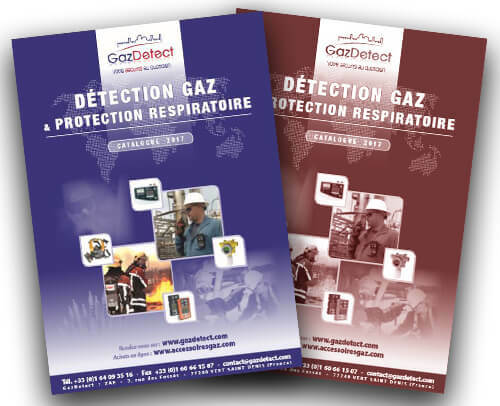 Air Products is one of GazDetect’s key partners because of the brand’s very large range of calibration gas, technical skills and ability to produce tailored gaseous mixtures. In addition, we store many calibration gas cylinders including short term stability mixtures to meet even more demanding requests!